The Town of Angier has a new man in the town manager’s seat. His name is Gerry Vincent and he has high hopes for the future. From a discussion about the anticipated growth to the controversies which have been a part of the recent past, Mr. Vincent offers honest, insightful and answers to the questions which seem to arise from such situations. Gerry Vincent has taken over the job of Town Manager in Angier. He comes to the community with 28 years of public service and a desire to help lead the town successfully into the future. 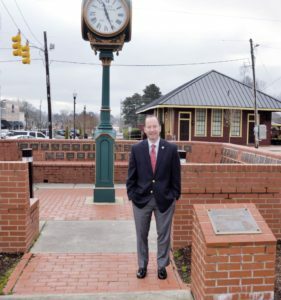 Here he’s seen posing for a photo at one of the town’s landmark locations, the Angier Centennial Clock. From a personal standpoint, Mr. Vincent has made the rounds about town introducing himself to residents at every opportunity. Mr. Vincent hails from Virginia, and calls himself a prototypical southerner. He offers his palate as one example. His exposure to serving in the government came from his father, a former U.S. Marine who decided to go to work in the government. That leads to the question of why he wanted to come to Angier. He said it wasn’t very complicated, he simply thought he would enjoy the small-town atmosphere and feeling that exists. He admits listening to what interim manager Mike McLaurin had to say about the town and combined it with his own research. He felt the combination of the size and an anticipation of making a difference in Angier were the most intriguing reasons to accept the job. Making the move from his native Virginia to Harnett County goes along with the long-range plan he and his family wanted to see come to fruition — being close to Raleigh. Mr. Vincent has family in the area, including his daughter who recently transferred to UNC Chapel Hill from Virginia Tech, and old friends. Mr. Vincent comes into the job facing several issues from both the past and the future. They range from the challenges of the addition of the N.C. 55 bypass to moving the town past the ghosts and demons of the recent past. Growth is one of the biggest challenges facing the town in the days ahead. He explains there is an explosion of growth just waiting beneath the surface and when it does erupt, the town has to be ready. Mr. Vincent would like to see the most looming example of that growth, the bypass, become a gateway to Angier. There’s also the economic development which the town has been clamoring and yearning for, even if it doesn’t come in the way most hope. He said with a recent decrease in actual manpower involved in manufacturing — in cases as much as 40 percent — it’s becoming a challenge to entice manufacturers to come to smaller areas, regardless of where. He addresses the questions which arise from the situation he described. Calling for the future to include a readiness to accept whatever comes. Mr. Vincent says the town board of commissioners needs to decide and look forward at how they will seek the solution. While all of those questions remain to be answered, there are several areas of the past which have caused controversy, both in Angier and in Mr. Vincent’s life. In early 2018, Mr. Vincent was serving as town manager of Huntersville, N.C., a post he resigned from following a physical altercation with his stepson. On Jan. 21, 2018, he was taken into custody and charged with simple misdemeanor assault, according to reports. He resigned almost immediately at the behest of the town council. Mr. Vincent addresses the situation frankly and admits it did happen. He said he and his wife were dealing with a stepson who was “headed in the wrong direction” and had been for about eight months. Mr. Vincent also says the incident has brought the family closer together. He said interventions in the wake of the incident helped right the family ship. “We’ve seen us where we’re to where we are now and it’s very strong,” he said. As far as anyone who has harbored ill feelings or who has been critical of town officials for hiring him in spite of their knowledge of the incident, Mr. Vincent offers a reassurance about the aftermath and the time away from public life. Next articleWho To Contact, Social Security Or Medicare?